The Landon Athletics Family has grown and they are now building their own facility. They are excited about this new adventure. The facility is located less than a mile east from Maple Valley High School in Vermontville. In an effort to raise money to help meet the needs of athlete’s with the new “Vault Barn,” and pay for the tree planting; we are asking you if you would like to join our project and Adopt-A-Tree. You can plant memories by donating $50 to the cause. The name of the person would then be placed on a plaque in recognition. 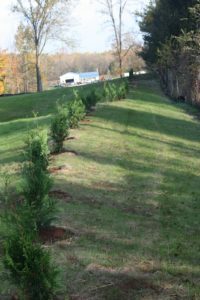 You may Adopt-A-Tree in your name, a grandchild’s name, in memory of, dedicated to, or any one you would like to honor and recognize. Just fill out the form below and send in your check for the number of trees you would like to adopt. We ask that there only be one name per tree adoption.